LIVE and PSN have become a nurturing ground for independent developers looking to sell their games to the widest audience possible. The Odd Gentlemen are one such developer, starting off as a student project, The Misadventures of P.B. 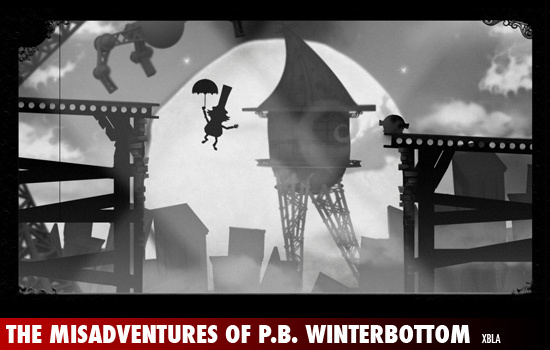 Winterbottom managed to transcend its indie roots with the help of 2K Play who released this highly stylized puzzle game on XBLA. You play as the titular Winterbottom, a gentleman thief, whose fetish is for pies. However, your over indulgent pie snatching antics lead to a rip in the space time continuum, a hole in which you whole heartedly jump in pursuit of a giant pie! The game is set up as a series of hub levels, each of which introduces a different rule set to the game. On a basic level you are able to create a set of Winterbottom clones that you send out to assist in pie collection. You can use them in various ways e.g. hit switches, jump gaps, or use a seesaw. As the game progresses the levels become more complex and you must use all your clones in a specific way so that you can collect every pie, which is required for you to complete the level. 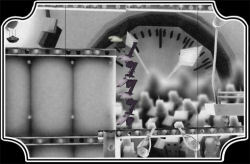 Each puzzle is set within a contained area; The Odd Gentlemen stop the game from becoming stale by regularly adding new variants such as a timer or having to collect pies in a certain order. Winterbottom is a game that is heavily influenced by the fantastic Braid. This is no clearer than when you enter a new hub of puzzles. Like Braid, Winterbottom has a different style of puzzle in each area. What starts off as a game that manipulates clones, soon becomes more brain teasing as other factors are introduced – none of which I want to spoil here. With several hubs, plus a series of time trial bonus levels, there is plenty here for a bargain 800 MSP. The time to complete the main game itself will depend on a player’s skill level, but 5 hours seems about right. The continuous challenge and altering of the puzzle dynamic keeps the game fresh throughout. I leave possibly the best element to last – the aesthetic of the game. The world is a twisted version of Victorian Britain, mixing Charles Dickens with Tim Burton. The Odd Gentlemen have taken the brave step of making the game black and white, and it looks brilliant for it. The music is also great and really adds to the atmosphere of the game; so rarely do I hear a catchy tune in games anymore. There are also some great illustrations and quirky poems between levels that act as a very amusing narrative. With its fantastic look and feel, challenging puzzles and good value for money, The Misadventures of P.B. Winterbottom is certainly one of the best XBLA games that I have played.